Having a master key system installed by a locksmith in Reno NV is a great idea for any business if they want to maintain the keys that are often in the possession of multiple people. 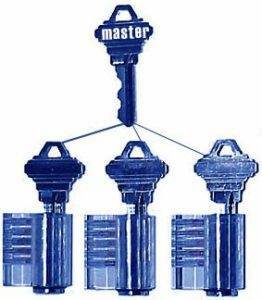 A master key system is actually easy to understand. A locksmith will rekey a series of locks so that they will fit to a single key. This single key will be what is called the master key. In addition, there will be a set of dummy keys created that will match only one lock within the locking system. These keys are what you can provide to your staff so that they can reach what they need. Having a master key system in use will save you money, time and provide your business with lock security. A master key system will create for you an opportunity to not have to carry so many keys at the same time. An employee will only possess a key to an area that to which they are held responsible. The owner will only possess the key that has the ability to open all doors of the business property. Within this system, you choose who to give keys to so that you know the location of each key. Utilizing a master key system at your business will lower your security risk at what will be low cost in long run. In addition such small changes will tremendously increase the protection of your property. Not only a master key is a cheap and successful choice, it is highly manageable. To further explain: If your business has three locks, then that would mean that for proper security a replacement or a rekey of those three locks by a commercial locksmith would need to happen whenever you had a switch of employees or when a key was lost. If a business possesses a master key system however, they would only need to change one lock which would only end up saving both time and money. A master key system is a reliable method of maintaining numerable locks that are oftentimes used by multiple people. No longer will you need to have all of your locks changed in your establishment by a professional Reno locksmith under bad circumstances, but rather only will need to replace one lock. A master key system is definitely a great decision that will provide an easily managed inventory for all of the keys to your business. This entry was posted in Locksmith Tips and tagged commercial locksmith, lock change, lock rekey, locksmith, locksmith reno, master key, reno, reno locksmith. Bookmark the permalink.